Jason Saves the World: A Full Day: Tampa - Everglades - the Keys - and Arrival in Miami! A Full Day: Tampa - Everglades - the Keys - and Arrival in Miami! We had to wake up at 6am, and leave Annie's apartment at 6:30. And, we were now an hour ahead in the Eastern Time Zone. We were up before the sun, which rose as we were driving through downtown Tampa. The air was comfortable, so I left the windows down for the first couple hours (and of course Ueli slept) until I stopped for coffee and donuts at Dunkin' Donuts in North Fort Meyers. Then, it was not much longer until we were in the Everglades. The surburban developments gradually tapered off into small rural houses and trailer parks and then into nothing but swampland. I saw an information center and stopped there for... information. The woman at the booth referred us to nearby Wooten's, which offered the cheapest airboat ride for 30 minutes (about $25 I think). Located in the Big Cypress National Preserve (which is thousands of acres originally bought by Mr. Wooten for hunting), Wooten's Swamp Tours also includes a mini-preserve of live alligators and other animals. Right after we bought our tickets, the mosquitoes and bugs descended on us viciously - there were 8 of them on my leg, and they wouldn't fly off when I swatted them! It was unbelievable. I darted into the bathroom and there was still one on my arm, which I killed, and there was a squirt of blood. Ewww. 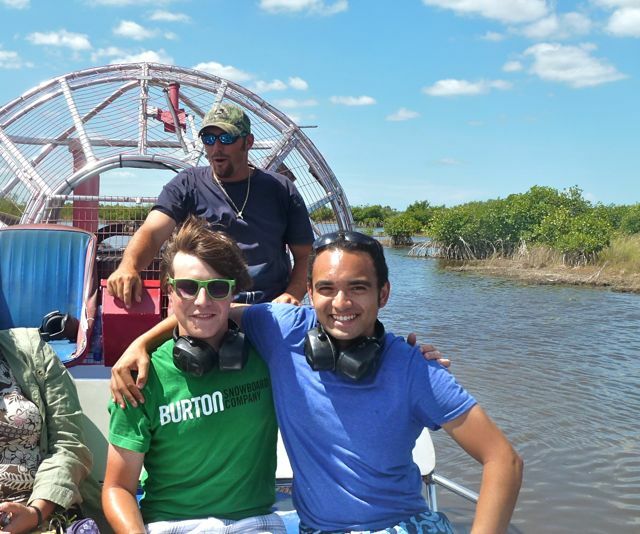 The airboat ride was an amazing experience! We were cruising and spinning atop the 1-foot-deep water. During the ride, we saw a big, 10-foot-long alligator, and our guide explained to us the ecology of the area (brackish [salt + fresh] water, red mangroves, cypress only growing in fresh water, the water being controlled by winds, not tides, etc.). It was a great and worthwhile way to experience the everglades on our drive through. It was still only 11:30 by the time we were done with the everglades, and it was our last day having a car, so we looked at the map and decided to drive the Florida Keys all the way to Key West! It doesn't look like too long of a drive on the map (about 150 miles / 240 km from Miami), but the speed limits are much lower, and with traffic, it becomes a nearly 4 hour trip. Stopping at the visitor center along the way, I found one of the cheapest cafes/ice creamery down the street with wifi (we needed to check our inboxes for our place to stay that night). My black bean burger at the cafe was salty and dry, and they charged me for a cup of ice water?! (Beware, folks, of eating anywhere along a well-touristed path - they'll shortchange you every chance they get). Onward, and traffic picked up. I pulled over to admire one of the many beaches we were driving past. The beach was different: Muddy sand, small shells all over, small sea plants/grass growing all around, which made the surface slimy and clammy to walk on. But the sea was shallow, warm, and absolutely gorgeous to look out across. It was another hour or so until we got into Key West. We stopped for hydration at Publix, then drove to the "southernmost point in the continental US" for an obligatory visit. Key West is an interesting beach town; it's small but big enough to have anything you need. There are plenty of artists, so it has a slightly funky/creative vibe which I haven't seen in many other towns in Florida. Ueli and I walked around for a little bit, and we found a rooster crossing the street (but why did the chicken cross the road?!!! ), so I chased the rooster for half a block down the street until it darted underneath a house. Then we went for some wifi. We still had no where to stay, except a backup house in Coral Springs (about 1-2 hours north of Miami - not good), but facing no other choice, I typed a reply saying that we'd come over. As I hit "send", the message wouldn't send for some reason, and then my phone rang at that exact moment. It was a girl in central Miami who could host us! What amazing timing! We quickly hit the road, seeing a hitchhiker (with a bike that we couldn't fit in the car - damn) and stopping to take in the sunset over the west keys. The drive back was a slow and dark on, but Ueli was at the wheel so I got to doze off. There were a couple tropical downpours that we suddenly got caught in as we entered the southern suburbs of Miami. I called our host (Audrey) several times but she wouldn't answer. We proceeded to her house, passing through downtown. I could feel the energy of the city already - it felt vibrant and cosmopolitan, with high-rise condos everywhere. Randomly, we got stuck in a traffic jam (at like 11:30pm) in downtown Miami. Turns out, it was because game 2 of the NBA finals was going on at the nearby American Airlines Arena. Ha ha! (The Heat lost to the Mavericks). I turned left and got us out of there, arriving at Audrey's house, but no one was there except for her aloof neighbor who wouldn't help us.